By now you’ve probably seen (or at least heard about) the popular ABC show War On Waste, which has us all thinking about how to reduce, reuse and recycle. It may surprise you that most coffee cups are not recycled! Personally, I love a good coffee. Okay, I drink A LOT of coffee, so this show came to my attention when friends and some of my fave shops were jumping on the Frank Green Eco Cup bandwagon. The first global analysis of all mass–produced plastics found we have produced 8.3 BILLION tonnes of plastic since the 1950’s. That’s the same weight as one billion elephants! Most of this plastic is finding its way to landfill or oceans and the production of plastic is showing no sign of slowing down and is expected to reach 34 billion by 2050! Today we’re surrounded by computers, photocopiers, printers, faxes, monitors, printers, faxes, and monitors! 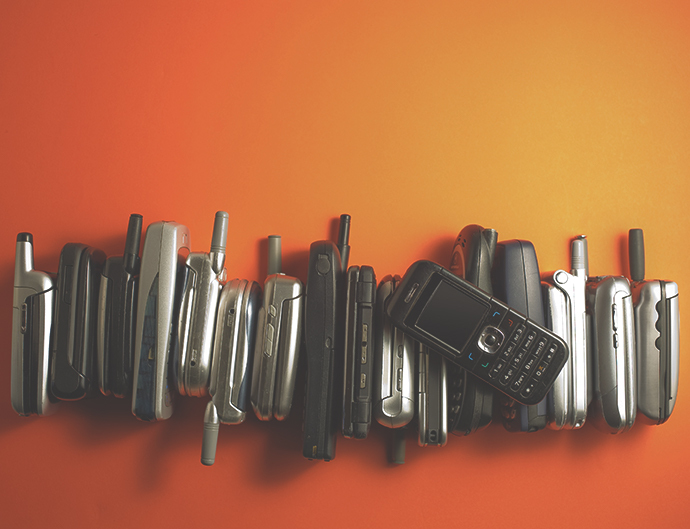 I know I’m guilty of hoarding my old phones and laptops instead of recycling them, and I’m not alone. Less than 1% of TVs and approximately 10% of computers are recycled Australia-wide. The biggest problem with e-waste is that when it’s sent to landfill, it’s typically broken up, then burned or dumped, and it doesn’t decompose. These processes cause poisonous substances such a lead and mercury to be released into the air as groundwater, soil, and ultimately, the food chain. It gets you thinking, right?! E-waste needs to go through a recycling system called a WEEE (Waste Electrical and Electronic Equipment). If you hang on to your old tech because you haven’t had time to wipe it all, don’t worry; this process recycles 95-98% of all e-waste passed through it and destroys any data left on hard drives and memories. Although, who says you need to get rid of it at all? Aussies appear to be attached to their old devices, with a survey from last year showing almost half of Australians keep their old phone lying around after they upgrade. Instead, how about getting creative, pulling them out of the box, and finding another use for them? Here are some suggestions for you! Entertainment for the kiddies (with the device in security lockdown of course). A mini stereo so your tunes don’t get interrupted by any calls. A handy security camera for your home. Or a handheld gaming device. Don’t mind a little DIY? If you have a few things around the house that need some love and care, Sydney has a pretty cool place called The Bower Reuse and Repair Centre that reduces landfill by repairing as many items as possible. The coolest bit is you can drop in to one of their Repair Cafes and learn a thing or two! If you’re ready to recycle your e-waste, you can call a company like 1800ewaste who know all the deets! They’ll safety and efficiently recycle your electronics and all you have to do is enquire and make an appointment. Some of the big tech companies are on board with seeing their products lifecycle through from beginning to end. Apple and Microsoft have info on their websites, and Close the Loop brings together a bunch of other companies to help recycle. So take a look and find the best option for you! Already erasing your e-waste? Let us know how you’ve recycled your e-waste in the comments. Is it time to do a stock take of your tech? I thought you were going to tell us how to erase data on our devices. Instead I got your ho hum story. A lot of local council libraries have bins setup for used batteries, phones, printer cartridges and dead high efficiency light globes. Give your council a ring to confirm if they have these services. Mandurah tip W. A. 6210 via Cleanaway has a free E waste Skip for TVs computer etc. I would suggest you could also contact you local Council/Shire to see if they or their agent have similar abilities to recycle your E waste for free. That’s good to know thanks David! Office Works takes back computers etc. to recycle, although I’ve no details on how they handle the recycling. Does anybody know how to recycle old DVDs and CDs properly? I have been recycling my e-waste for many years now, through companies such as 1800ewaste and our local council has an e-waste and plastics recycling day twice a year where residents can drop all this stuff off. One interesting observation is that people will transfer their outdated phones or tablets to their parents or elders. The concept of recycling may need some more thoughts. It is also the challenge of getting older people more savvy in using newer technology so as the gears’ life can be prolonged. Otherwise they will be landfilled but in coffins. We are lucky here on the Tweed as the council will take all your e-waste for recycling. The only one I’m not sure about is an old computer because I am not sure how to erase the hard drive before handing it in. The recycling system that e-waste goes through should destroy any data left on the hard drives and memories. Often people hang on to their old devices so that the data is not available when disposed. May I suggest an article on how to easily erase data on various devices. This may help facilitate the disposal of old e-stuff. Thanks David! I will keep this in mind for the future. Our local Council has a bin for used phones and batteries in the foyer of their Offices, and has an ewaste collection at the Transfer Station once a year – all free. But they’re pretty goos at all things related to recycling! Thanx for the motivation !! Don’t leave it too long or they’ll be taking cellfies! Hi Caroline, I use my old CD’s and DVD’s in my fruit trees to keep a few of the birds away from the fruit. Not recycling as commonly thought – but re-using well! Kingfisher Recycling Centre, 31 Dorville Road, Aspley, Queensland 4034 will accept computers, etc for recycling. (Assists people with disabilities and has many people who volunteer their time and expertise). MobileMuster is the Australian mobile phone industry’s official product stewardship program. It’s a free not for profit mobile phone recycling program that accepts all brands and types of mobile phones, plus their batteries, chargers and accessories. It is the mobile phone industry’s way of ensuring old mobile phone products don’t end up in landfill – but instead are recycled in a safe, secure and ethical way. Thank you for the tip and for sharing this article! I’ve never hears of deets whatever they are. Is this one of those young person’s “in” words where they are trying to change the world by rewriting the English language. If it means “details” why not write that instead so we all know what you mean! Anyway my local council has a hard collection twice yearly when they pick up e-waste and recycle it. I just wanted to type a small note to be able to appreciate you for some of the splendid secrets you are writing on this site. My particularly long internet search has finally been rewarded with excellent concept to go over with my close friends. I ‘d suppose that most of us visitors actually are extremely fortunate to exist in a decent site with many special people with very beneficial tips and hints. I feel extremely happy to have come across your entire website and look forward to tons of more amazing moments reading here. Thank you once more for everything. Hi- is IInet part of the mobile musters campaign? No, we are not a part of the Mobile Musters campaign. Iinet / Fetch need to take ownership of their waste. It’s disheartning to be told by Iinet to put the old fetch box in the bin. No collection policy, no ability to take the box to a repair centre to fix a dead HDD. The policy submitted quoting ABC War on Waste then saying take it to a centre is poor community engagement, set up a recycle system, allow users a refurbished unit as an option. Take the lead! I agree with Mick. I have a Gen 2 box sitting on my lounge room floor while I find out what to do with it. iinet should take more responsibility for this. Hi Gillian, thank you for taking the time to comment! Regarding your Gen 2 Fetch set top box, should you no longer require it I would encourage you to check with your local council as to their e-waste disposal methods. Some will allow for e-waste to be collected at your local recycling center, while others may hold “drop-off days” where you can take it to be collected and recycled. I agree with Mick: “Iinet / Fetch need to take ownership of their waste. It’s disheartning to be told by Iinet to put the old fetch box in the bin. No collection policy, no ability to take the box to a repair centre to fix a dead HDD. I also spoke up about this on ABC Radio Brisbane: https://www.abc.net.au/radio/brisbane/programs/focus/mornings/10932418?fbclid=IwAR1j_aIQbcZ4wopQ73AgfpTPDB983FpNERz_rMk2VFSNn4t-9-UTWMsi0NM (1 hr. 6 mins, 49 seconds) But the NBN rep said that apparently some providers offer recycling. IMHO, iiNet has passed on the responsibility and needs to include a return scheme (e.g. pre-paid return box) for all old modems. Millions of modems going into landfill is not progress even if the NBN does roll out as planned. Otherwise, we’ll just use our new fast internet connections to research how to cope with the growth in e-waste-related illness…. I contacted 1800ewaste yesterday. Apparently it will cost $132 for them to pick up and recycle my modem. iiNet, the NBN and other providers must provide a cheaper, more convenient way to recycle old modems. I’ll bet most customers will just dump them in their bins, resulting in millions of modems adding to e-waste.